First class fireman's exam from 11/19/96. 1. How do you start a turbine driven feed water pump? 2. 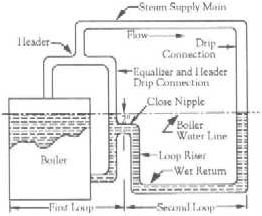 How do you prepare a boiler for internal inspection? 3. What are these stamps S,M,L,V ? 4. Explain a single pipe heating system and a two pipe heating system? 5. List four reasons why a radiator would fail to heat up properly? 6. Are there more than one type of fusible plug? If so explain the difference. 8. Figure the area of a piston on a duplex pump with a six inch diameter. show all work and would the other side of the piston have the exact same area? 9. What is a Hartford Loop? 10. What is? A:) corrosion B.) Erosion? 11. What is? A.) Pitting and cause B.) Foaming and cause? 12. What is combustion and what elements in fuel are combustible ? 13. How do you know you have enough air going into your furnace? 14. Why would you use a vacuum pump in a heating system ? 15. What is pH explain in detail. What is a good boiler pH? 16. What is an economizer and where is it located ? 17. How do you take a boiler off line? 18. What information is on the tag of a safety valve? 19. Why are hand holes and manholes oval ? 20. What can you do with this license ?